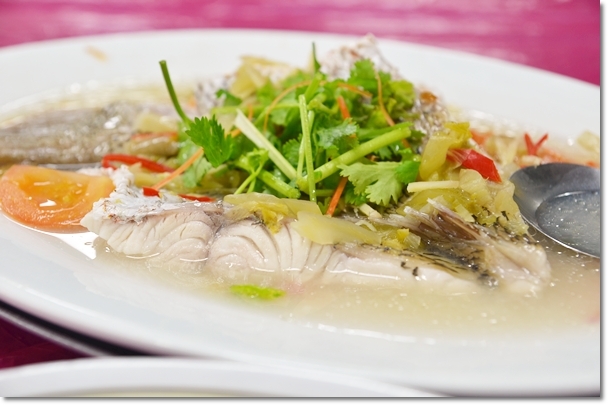 Steamed Fish Teochew Style; in a clear broth lightly infused with Chinese wine and a tangy mix of tomatoes, preserved vegetables and chopped bright red chillies. Started off with a satisfying lunch in the midst of a residential area; a food court like restaurant named San Low Seafood in Taman Pelangi. 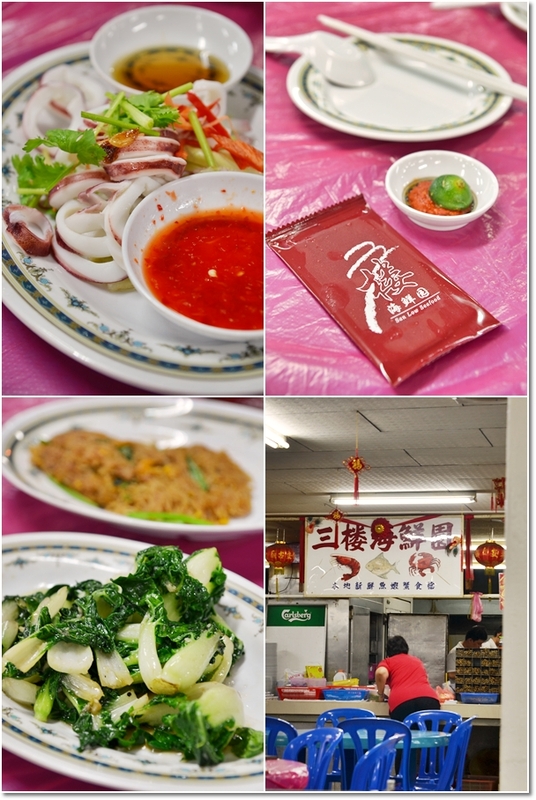 Signatures include of course; the famous Three-Storey Fried Beehoon which got its name from the restaurant’s initial operating premise in front of a three-storey flat, fresh catches steamed Teochew style, Sambal cockles, and various ‘chu char’ dishes depicted on the walls. We also had the plain steamed squid with two distinctly different dips; one being garlic chili sauce and another was a honey and shallot oil combination (tasted like such, but could not put my finger on it), and a plate of beautifully stir-fried “siew bak choy”. The restaurant was already crawling with customers come dinner hours; with some clearly on a high picking on seemingly endless supplies of crustaceans (crabs and prawns alike), and almost every table with their own plate of … the aforementioned fried beehoon. “You sure you want to order fried beehoon in a seafood restaurant?” The cynical Motormouth could not help but shared his reservations. “Oh, don’t worry. 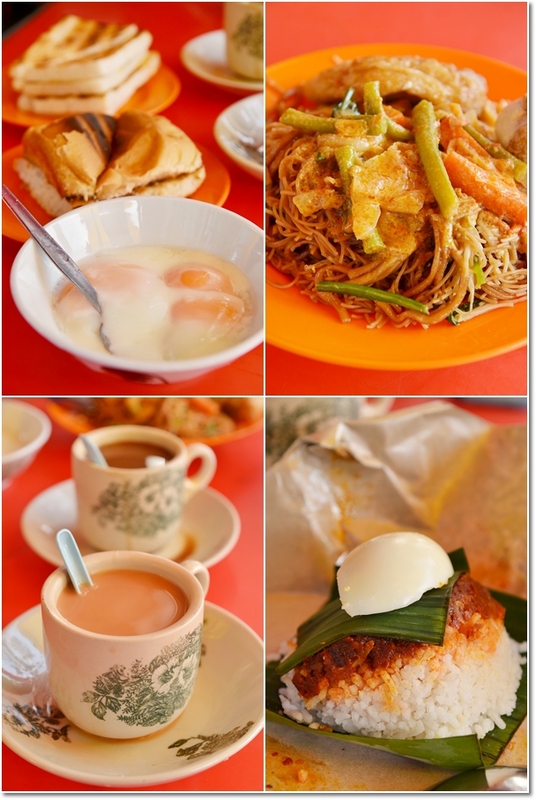 The fried beehoon here is not the same as what you are used to have in KL” came the reply from the grinning Malaccan. Indeed. 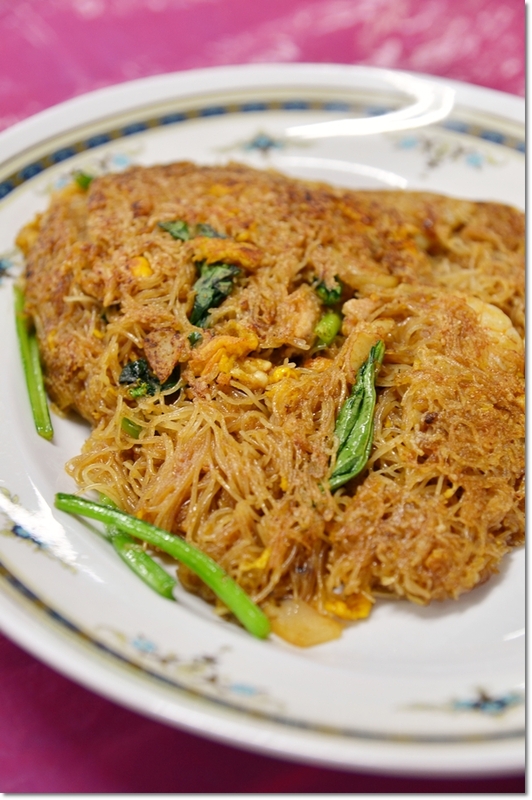 The plate of fried beehoon arrived in a most unpalatable fashion; like as though the noodles have been over-fried and stuck together in a lumpy mess. One mouthful of the noodles, and I knew why this was a hit, not only with the locals but Singaporeans alike. The rice vermicelli noodles are made from good quality flour, and fried to a dry consistency yet maintaining that moist within. The outer portions of the noodles have been almost pan-fried, or flash-fried to a crispy texture; lending a very different dimension to the otherwise plain fried noodles. The addition of eggs, shrimps and sliced fish cakes with ‘choy sum’ completed the ensemble, but don’t forget the killer sambal (chili paste) with a squeeze of lime. Was this good? Well …. we had seconds. And I am not even a fan of bee hoon, actually. 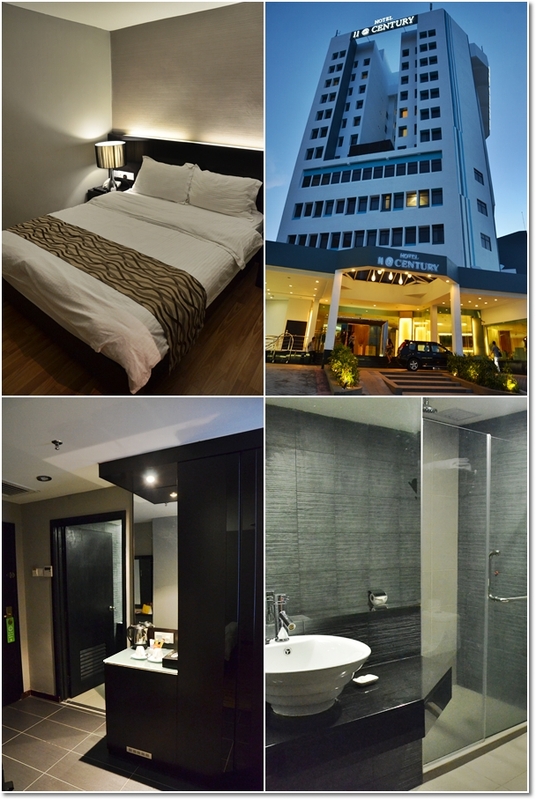 11@Century Hotel next to KSL City; a shopping mall in Taman Century. Clean, spacious and relatively new, with a killer rate to boot. A room for two came to about RM138 (corporate rate), with breakfast included. Within walking distance from the hotel, you can find Yit Foh Noodle House that operates round the clock. Seriously, a wantan mee stall that opens 24 hours, so that you know you don’t have to scout high and low for a mamak stall if you’re hungry during the odd hours. Wantan Mee with Char Siew (BBQ pork), Fried fish cakes, the pork dumplings and glasses of milk tea to start the day with. All for under RM20/USD7 for two pax. Yit Foh (they even have their own website) was established back in 1970. They have their own recipes for the egg noodles, passed down through generations, and even the ‘char siew’ are made freshly everyday. The difference between the wantan mee here and the ones in the northern regions (KL/Selangor included) is that Johoreans tend to like theirs with either chili sauce, or dark soy sauce, or a combination of both. At Yit Foh, they added the chili sauce without even notifying you, so if you’re not keen, you’d better inform in advance. But seriously, the sauces made all the difference. Another Three-Storey Fried Beehoon?! Yup. This one at Ah Kaw Seafood Restaurant in Taman Pelangi. On the very next night, we had another round of the famous Johor fried beehoon; this time at Ah Kaw Seafood. The boss, Ah Kaw came up with the cooking method for this back in 1979, and although I am not sure of whether this or San Low‘s was the originator, both have their merits I guess. Once again, fried to a slight charred/crispy texture yet not burnt, and possessing enough ‘wok hei’ to carry this through. The sambal belacan was good as well as condiment to the noodles. However, I felt that San Low‘s version fared much better in terms of flavours maybe because of the abundance of eggs used. The Fragrant Fish Head (Kam Heong) chopped into deep fried chunks then stir-fried in a sweet, spicy and savoury sauce with curry leaves and bird’s eye chillies left quite an impression, while the other dishes were merely passable. Dinner was a satisfying rendezvous with an old friend, catching up on stories during the hiatus. The meal came short of RM100/USD33 for the 4 of us, and still a pretty reasonable sum to pay given the size of the portions served here. We adjourned for tea at a mamak stall somewhere near to Taman Pelangi as well, but I had no inkling of where exactly it was, or even vaguely remember the name. 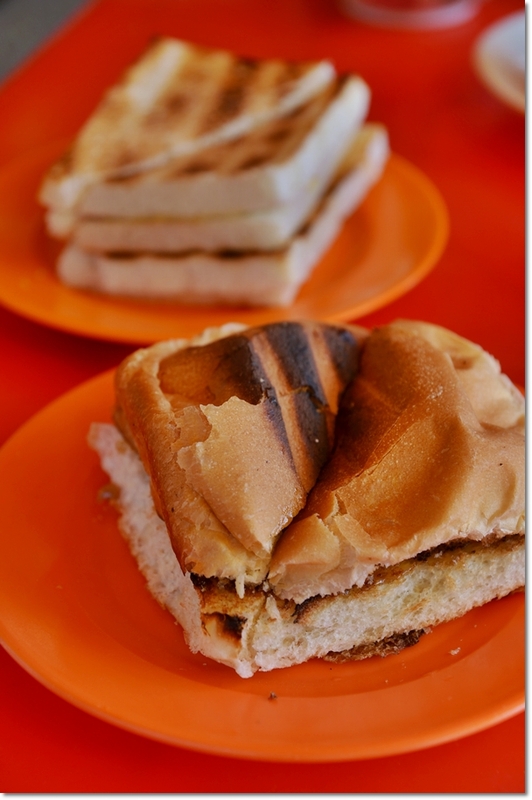 A piece of beauty to my eyes; a traditional Apollo bun toasted on the grill laced with butter and kaya @ Kin Wah Coffee Shop on Jalan Tan Hiok Nee. Breakfast on the last day was a Hainanese affair; and given my lineage, I love anything Hainanese. So when I was brought to Kin Wah Coffee Shop for a bout of toasts, eggs and coffee/tea, I immediately agreed to the idea. Nasi Lemak Bungkus, Fried Beehoon in curry, silky smooth milk tea and coffee and the delectable combination of toast and eggs. 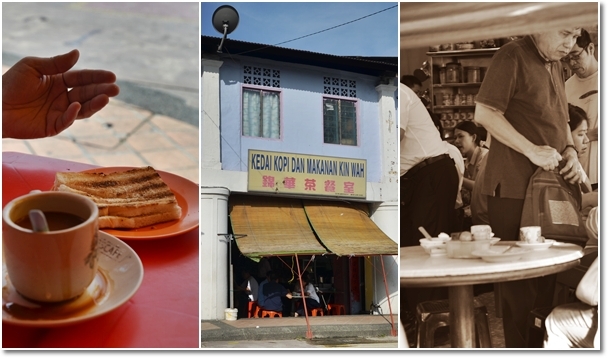 A taste of nostalgia; Kin Wah has been operating for more than half a century now. There is also a nasi padang stall inside the premise that was doing brisk business that morning. 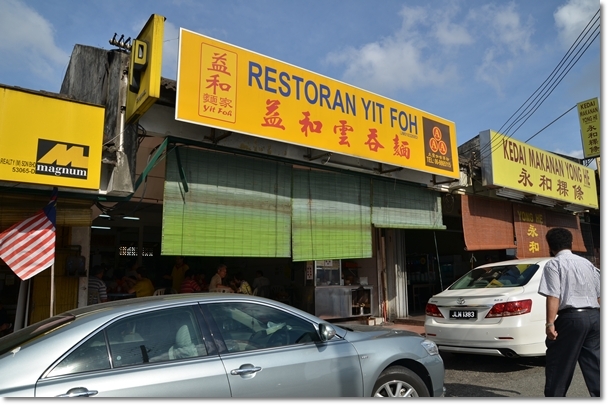 Kin Wah can easily passes off as a shop that glorifies 1Malaysia; much like Chong Kok in Klang and Yut Sun in Taiping. People from all ethnicity and age groups gathered over cups of coffee and half-boiled eggs, while some happily digging into their packets of nasi lemak and plates of nasi padang. Almost spitting distance from here, you can buy traditionally-baked buns and a supposedly irresistible freshly-baked banana cake (at 3pm) at a cake shop named Hiap Joo. The 3 days spent in JB really opened my eyes to how you can never rule out any state in Malaysia in terms of spicing up your palate with different cuisines, or dishes that you thought you knew but you actually don’t. Yes, I was actually down to Johor for work but in return, I gathered enough materials to supplement a full post, and instilled in me a renewed vigour to drive this insatiable appetite to all over the country. Where’s your next destination then? Business Hours : 24 hours, closed on Thursdays. Good .. then be sure to share with us your findings too ya? oh boy…its 216am and all these good yummy pictures (and no doubt equally yummy tasting food) is making me go crazy. Haha … why are you still awake at that hour?!!! Craving’s killing you huh? I understand what you mean, Sean. For I’m not a fan of bee hoon either. But this was actually good, like the Singaporean fried beehoon here but with a smoky aroma from the intense heat of the wok. You are lucky you didn’t get slaughter for that fish. Many food outlets in JB thought we are Singaporeans and charge ridiculous price. The fish looks good though. 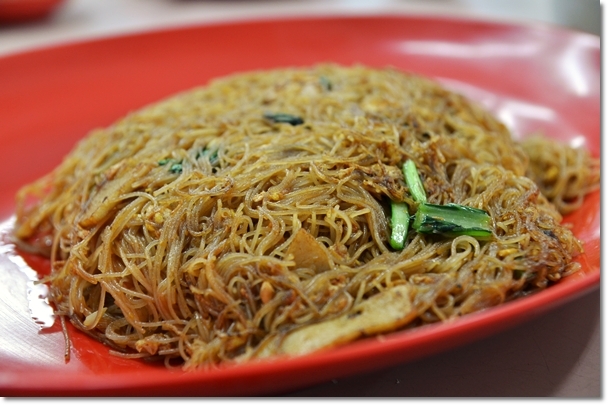 Im NOT a fan of beehoon too. 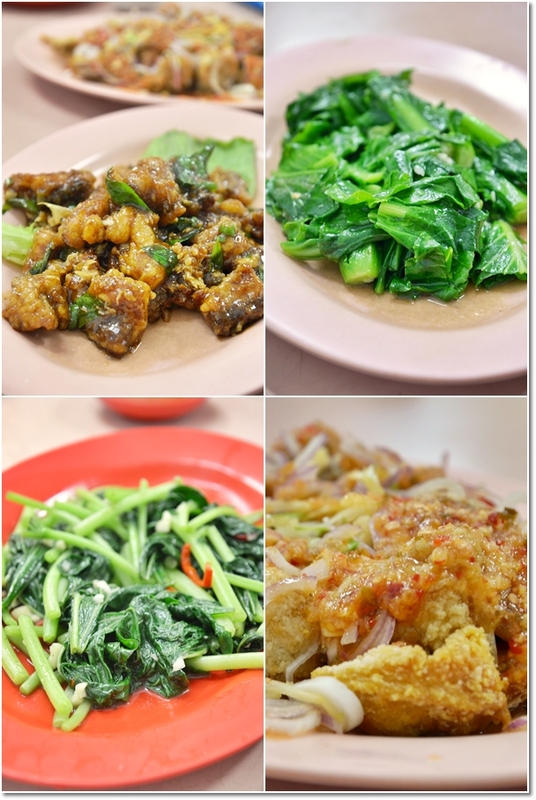 BUT the fare @ San Low seems delicious. You’re most welcomed, aslee. Yes, I am not a fan of bee hoon too, but the fried ones here was pretty delicious.